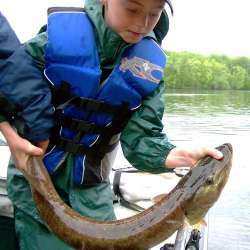 maskinonge, muskallonge, mascalonge, muskie, musky, 'lunge, silver muskellunge, Great Lakes muskellunge, Ohio muskellunge, Allegheny River muskellunge, spotted muskellunge, barred muskellunge, great muskellunge, great pike, blue pike, etc. Occasionally, it is referred to as a "jack" in some areas. Silvery background with dark, variable markings, often as oblique stripes, spots, or blotches, or even with scarcely any markings. Belly white with small spots. Fins green to red-brown with dark blotches. Young (less than 150 ram) with broad scalloped bars of olive green along sides and gold mid-dorsal stripe on back; belly white. 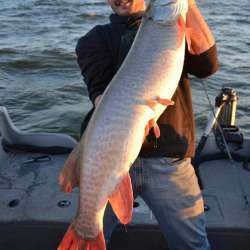 For more Muskie photos visit Lake-Link's Photo Gallery. The muskellunge occurs in all three drainage basins in Wisconsin (Lake Michigan, Mississippi River, and Lake Superior) but is most widely distributed in the Chippewa, Flambeau, St. Croix, Black, and Wisconsin rivers of the Mississippi basin. Its presence in central and southern Wisconsin is the result of widespread stocking of fry and fingerlings. Within the north and south limits of the Wisconsin muskellunge range, spawning occurs from mid-April to mid-May, with the peak occurring early in the season. Optimum spawning temperature is about 55º F, but may range from 49 to 60º F. Eggs are usually deposited indiscriminantly over several hundred yards of shoreline. There is no parental care. Adult spawners return to the same spawning ground in consecutive years. 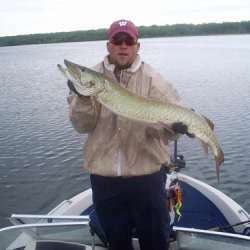 The natural home for the musky is in the northern lakes and rivers. It is a solitary fish and lurks in weed beds or other protective cover. 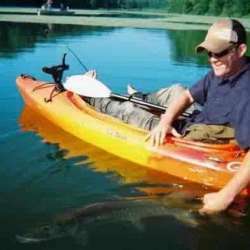 Anglers usually have the best luck fishing during the daytime. Large plugs, spoons, and bucktails are the best artificial baits. A live fish bait 10-12 inches long is also good. 38 lbs 8 ozs caught on Kaskaskia River on April 20, 2002. 42 lbs 8 ozs caught by Darrin Conley caught on James Lake on January 1, 2002. 50 lbs 6 ozs caught by Kevin Cardwell caught on Spirit Lake, Dickinson County on August 1, 2000. 48 lbs 0 ozs caught by Charles S. Edgecomb caught on Skegemog Lake on January 1, 1984. 45 lbs 0 ozs caught by William Pivar caught on Thousand Island Lake, Gogebic County on January 1, 1980. 54 lbs 0 ozs caught on Lake Winnibigoshish . 69 lbs 11 ozs caught on Chippewa Flowage on October 20, 1949.